Based on satellite observations, KVERT reported that on 30 August a gas-and-ash plume from Chikurachki rose to an altitude of 2.5 km (8,200 ft) a.s.l. and drifted 35 km SE. The Aviation Color Code was raised to Yellow (the second lowest level on a four-color scale). An explosive episode at Chikurachki occurred during 15-18 February 2015, the first eruption since the 29 July-8 August 2008 event (BGVN 33:08 and 41:06). The Kamchatka Volcanic Eruptions Response Team (KVERT) does not monitor the volcano with seismic instruments, but uses satellite monitoring and receives occasional visual observations. All dates and times are local (UTC + 12 hours). According to KVERT, during 29-31 March 2016 a strong explosive eruption generated ash plumes that rose to a maximum altitude of 4 km and drifted 570 km NE, S, and SW. The initial activity was a gas-and-steam plume containing ash at 1240 on 29 March. At 1259 the Terra satellite imaged ash plumes that rose to an altitude of 3 km and drifted about 50 km NE. The Aviation Color Code (ACC) was raised to Orange (the second highest level on a four-color scale). An SO2 plume was identified in Aura/OMI data at 1400 (0200 UTC) on 30 March downwind SSE from the volcano (figure 11). This moderate activity continued into 1 April before subsiding. The ACC was lowered to Yellow on 2 April, and then to Green on 4 April. Figure 11. Sulfur dioxide plume drifting SSE detected using the Ozone Monitoring Instrument (OMI) on the Aura satellite, 30 March 2016. Estimated SO2 mass was 2.3 kt. Courtesy of NASA Goddard Space Flight Center. A new eruption began on 27 July 2016 at 1748 when an ash plume rose to an altitude of 4-5 km and drifted 176 km NE. Minor ashfall was reported in Severo-Kurilsk (Paramushir Island), about 61 km NE. The ACC was raised to Orange. A long detached plume of SO2 was identified in Aura/OMI data drifting NE of the volcano at 1311 (0111 UTC) on 28 July (figure 12). Heightened activity continued until 29 July local when activity subsided. The ACC was lowered to Yellow on 30 July and to Green by 3 August. Figure 12. Sulfur dioxide plume drifting NE detected using the Ozone Monitoring Instrument (OMI) on the Aura satellite, 28 July 2016. Estimated SO2 mass was 4.2 kt. Courtesy of NASA Goddard Space Flight Center. Another moderate episode of activity began on 18 August 2016. KVERT reported that strong gas-steam emissions were visible during 1132-1700 on that date. Ash was visible in the plume beginning at 1720, prompting KVERT to raise the ACC to Orange. Gas-and-steam plumes containing ash rose as high as 4.5 km altitude and drifted 280 km NE. Minor ashfall was reported in Severo-Kurilsk. According to the Tokyo Volcanic Ash Advisory Center (VAAC), as cited by KVERT, ash was no longer detected in the plume starting at 2330 on 19 August. The ACC was lowered to Yellow on 19 August, and then to Green on 20 August. Based on satellite observations, KVERT reported that on 29 August gas-and-steam plumes containing ash rose to an altitude of 2.5 km and drifted 35 km SE. The ACC was raised to Yellow. The next day, the volcano was quiet, although KVERT believes that moderate gas-and-steam activity probably continued. On 31 August the ACC was lowered to Green. Thermal anomalies, based on MODIS satellite instruments analyzed using the MODVOLC algorithm, were not observed during the reporting period. Information Contacts: Kamchatka Volcanic Eruptions Response Team (KVERT), Far East Division, Russian Academy of Sciences, 9 Piip Blvd., Petropavlovsk-Kamchatsky, 683006, Russia (URL: http://www.kscnet.ru/ivs/); Tokyo Volcanic Ash Advisory Center (VAAC), Tokyo, Japan (URL: http://ds.data.jma.go.jp/svd/vaac/data/); OMI (Ozone Monitoring Instrument), Global Sulfur Dioxide Monitoring, Atmospheric Chemistry & Dynamics, NASA Goddard Space Flight Center, Goddard, Maryland, USA (URL: https://so2.gsfc.nasa.gov/); Hawai'i Institute of Geophysics and Planetology (HIGP), MODVOLC Thermal Alerts System, School of Ocean and Earth Science and Technology (SOEST), Univ. of Hawai'i, 2525 Correa Road, Honolulu, HI 96822, USA (URL: http://modis.higp.hawaii.edu/). KVERT reported that an explosive eruption at Chikurachki’s summit crater continued during 22-29 July. Satellite images showed an ash plume drifting 176 km NE on 27 July. The Aviation Color Code remained at Orange (the second highest level on a four-color scale). 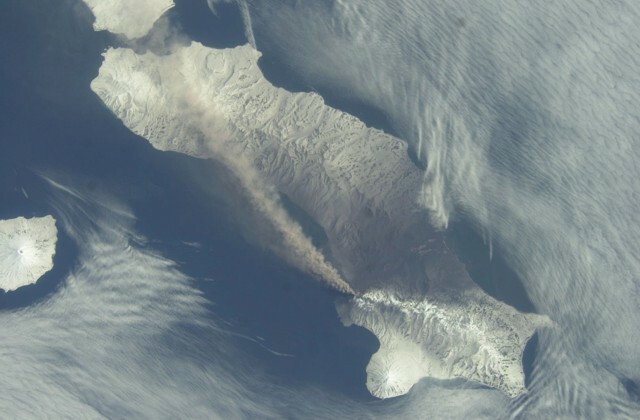 Based on satellite data, KVERT reported that an eruption at Chikurachki began on 27 July. An ash plume, first identified at 1748, rose to altitudes of 4-5 km (13,100-16,400 ft) a.s.l. and drifted about 100 km NE. The Aviation Color Code was raised to Orange. KVERT reported that a strong explosive eruption at Chikurachki during 29-31 March generated ash plumes that rose to a maximum altitude of 4 km (13,100 ft) a.s.l. and drifted 570 km NE, S, and SW. The volcano was quiet afterwards; the Aviation Color Code was lowered to Yellow on 2 April, and then to Green on 5 April. KVERT reported that at 1259 on 29 March an ash plume from Chikurachki was observed in satellite images rising to an altitude of 3 km (10,000 ft) a.s.l. and drifting about 50 km NE. The Aviation Color Code was raised to Orange. By 0852 on 30 March the ash plume was drifting 87 km S. Chikurachki is not monitored with seismic instruments but is observed using ground-based methods and satellite images. KVERT reported that, based on analysis of satellite images of Chikurachki from 18 April, a thermal anomaly and ash plumes were not detected; an observer from Severo-Kurilsk (60 km NW, Paramushir Island) had reported a minor ash plume. The Aviation Color Code was lowered back to Green on 24 April. An observer from Severo-Kurilsk (60 km NW, Paramushir Island) reported that on 18 April a gas-and-steam plume from Chikurachki contained a small amount of ash. The Aviation Color Code was raised to Yellow. KVERT reported no ash plumes from Chikurachki during 1-19 September, although clouds mostly prevented satellite image views during 6-14 September. The Level of Concern Color Code was lowered to Green on 19 September. KVERT reported that clouds mostly prevented satellite image views of Chikurachki during 22-29 August. No ash plumes were observed during times of clearer weather. The level of seismicity was unknown because Chikurachki lacks dedicated seismic instruments. The Level of Concern Color Code was lowered to Yellow. KVERT reported that clouds prevented satellite image views of Chikurachki during 15-22 August. The level of seismicity was unknown because Chikurachki lacks dedicated seismic instruments. The Level of Concern Color Code remained at Orange. KVERT reported that clouds prevented satellite image views of Chikurachki during 8-15 August. The level of seismicity was unknown because Chikurachki lacks dedicated seismic instruments. The Level of Concern Color Code remained at Orange. Based on observations of satellite imagery, KVERT reported that eruptive activity from Chikurachki continued during 1-8 August. Ash plumes drifted more than 60 km SE, W, and N during 1-3 August. The level of seismicity was unknown because Chikurachki lacks dedicated seismic instruments. The Level of Concern Color Code remained at Orange. Based on observations of satellite imagery, KVERT reported that during 30-31July ash plumes from Chikurachki drifted S. The level of seismicity was unknown because Chikurachki lacks dedicated seismic instruments. The Level of Concern Color Code was raised to Orange. Based on reports from KVERT, the Tokyo VAAC reported that on 1 August, an ash plume rose to an altitude of 2.7 km (9,000 ft) a.s.l. and drifted SE. Based on observations of satellite imagery, KVERT reported that on 29 July an ash plume from Chikurachki drifted more than 30 km WSW. The level of seismicity was unknown because Chikurachki lacks dedicated seismic instruments. The Level of Concern Color Code was raised to Yellow. Based on reports from KVERT, the Tokyo VAAC reported that on 29 July, an eruption plume rose to an altitude of 6.1 km (20,000 ft) a.s.l. KVERT reported that clouds obscured satellite views of Chikurachki during 2-9 November. The Level of Concern Color Code remained at Orange. KVERT reported that clouds obscured satellite views of Chikurachki during 26 October-2 November. The Level of Concern Color Code remained at Orange. KVERT reported that ash plumes from Chikurachki were visible on satellite imagery and drifted NW on 20 October. Clouds obscured views of the summit on other days during 19-26 October. The Level of Concern Color Code remained at Orange. KVERT reported that ash plumes from Chikurachki were visible on satellite imagery and drifted NE on 17 and 18 October. Clouds obscured views of the summit on other days during 12-19 October. The Level of Concern Color Code remained at Orange. KVERT reported that gas-and-ash plumes from Chikurachki were visible on satellite imagery and drifted NE on 7 and 10 October. Clouds obscured views of the summit on other days during 5-12 October. The Level of Concern Color Code remained at Orange. KVERT reported that a gas-and-ash plume from Chikurachki was visible on satellite imagery drifting ESE on 4 October. Chikurachki volcano is not monitored with seismic instruments. The Level of Concern Color Code remained at Orange. KVERT reported that explosions from Chikurachki produced gas-and-ash plumes that were visible on satellite imagery and drifted ESE on 21 September. Clouds obscured views of the summit during 22-28 September. The Level of Concern Color Code remained at Orange. KVERT reported that explosions from Chikurachki produced ash plumes that were visible on satellite imagery and drifted SE during 18-19 September. Clouds obscured views of the summit during 15-17 and 20-21 September. The Level of Concern Color Code remained at Orange. KVERT reported that explosions from Chikurachki produced ash plumes that were visible on satellite imagery drifting SE on 7 September and ESE on 8 September. Based on visual observations, ash plumes rose to an altitude of 2.3 km (7,500 ft) a.s.l. on 8 and 11 September. Clouds obscured views during 9-10 and 12-13 September. The Level of Concern Color Code remained at Orange. Based on ground and aerial observations, KVERT reported that explosions from Chikurachki produced ash plumes that rose to an altitude of 3.2 km (9,800 ft) a.s.l. during 31 August-7 September. Ash plumes were visible on satellite imagery drifting NE on 31 August and 1 September, and S and SE on 3 September. The Level of Concern Color Code remained at Orange. Based on visual observations, KVERT reported that explosions from Chikurachki produced ash plumes during 21-26 August. Ash plumes were visible on satellite imagery drifting NE during 28-30 August. The Level of Concern Color Code remained at Orange. Based on observations of satellite imagery, the Tokyo VAAC reported that possible eruption plumes rose to an altitude of 3 km (10,000 ft) a.s.l. during 1-3 September. KVERT reported that visual observations of Chikurachki were inhibited by cloud cover during 22-24 August. The Level of Concern Color Code remained at Orange. Based on observations of satellite imagery, an ash plume from Chikurachki drifted about 120 km to the SE on 19 August. KVERT raised the Level of Concern Color Code from Green to Orange. The Tokyo VAAC reported that ash plumes rose to altitudes of 4.3-5.2 km (14,000-17,000 ft) a.s.l. during 20-21 August, based on observations of satellite imagery and information from KVERT. KVERT reported that bursts of volcanic bombs from Chikurachki were observed by hunters on 15 April. Ash plumes were seen on satellite imagery drifting SE on 14 April and WNW during 15-16 April. Ash plumes rose to altitudes of 3.8 km (12,500 ft) a.s.l. and drifted N on 18 April. The Level of Concern Color Code remained at Orange. Based on satellite imagery, KVERT reported that an ash plume from Chikurachki drifted 200 km NE on 4 April. On 5 April, the Tokyo VAAC reported that a possible eruption plume to an altitude of 4.3 km (14,000 ft) a.s.l. was seen on satellite imagery drifting N. Explosive activity continued on 9 April. On 10 April, KVERT set the Level of Concern Color Code to Orange. AVO reported that a sulfur dioxide cloud from Chikurachki was seen on satellite imagery on 16 March extending 580 km NW. The altitude of the cloud was unknown. During 11-12 March, a diffuse ash plume from Chikurachki was seen on satellite imagery drifting E. The plume rose to an estimated altitude of below 4.6 km (15,000 ft) a.s.l. On 4 March, weak ash explosions from Chikurachki were reported by residents of Podgorny village (Paramushir Island), about 20 km SSE. On 5 March, observers reported a continuous ash column to an altitude of 3.4 km (11,000 ft) a.s.l. During 15-22 April, satellite imagery of Chikurachki lacked a thermal anomaly or ash plumes, so KVERT reduced the Concern Color Code from Orange to Yellow. On 7 April, an ash-and-gas plume rose to ~500 m above Chikurachki's crater (~7,600 ft a.s.l.) and extended ~10 km S. During 7-15 April, Chikurachki remained at Concern Color Code Orange. During 4-5 April, weak fumarolic activity occurred at Chikurachki. Ash deposits covered the WNW slope of the volcano. During 1-8 April, Chikurachki remained at Concern Color Code Orange. Ash from Chikurachki fell on the southern part of Paramushir Island on 29 March. Ash deposits were visible on satellite imagery on 25 and 29 March. Deposits on the 29th extended 19 km SE. Chikurachki remained at Concern Color Code Orange. On 25 March, KVERT raised the Concern Color Code at Chikurachki from Yellow to Orange. On 23 March, satellite imagery showed a weak ash plume extending ~70 km (~44 mi) E of the volcano. The height of the plume was unknown. The Concern Color Code was originally raised from Green to Yellow on 12 March when explosions were first noted. Chikurachki is not monitored with seismic instruments. KVERT has satellite data and occasional visual observations of the volcano. Increased volcanic activity at Chikurachki on 12 March led KVERT to raise the Concern Color Code from Green to Yellow. Prior to the increase in Concern Color Code, on 1 March observers in Severo-Kurilsk (~70 km NE of Chikurachki) saw a gas-and-steam plume rise ~400 m above the volcano. On 12 March MODIS satellite imagery showed an ash plume extending NNW from the volcano. Chikurachki last erupted during April to June 2003. The Concern Color Code at Chikurachki was reduced from Orange to Yellow during 27 June- 4 July. No eruptive activity was visible on satellite imagery during the report period and the volcano is not seismically monitored. During 17-25 June, only gas-and-steam emissions were observed at Chikurachki. No signs of volcanic activity were seen on satellite imagery during 25-26 June, possibly marking a break in the eruption according to KVERT. The level of seismicity was unknown because Chikurachki is not monitored with seismic instruments. Chikurachki remained at Concern Color Code Orange. Volcanism continued at moderate levels at Chikurachki through 18 June. On 15 and 16 June steady ash plumes were observed that were bent down the volcano's flanks by strong winds. Chikurachki remained at Concern Color Code Orange. The eruption that began at Chikurachki on 18 April continued during 30 May to 6 June, with several explosions occurring. The highest rising ash plume was emitted on 28 May at 0900, rose 4 km above the crater, and drifted NE. An eruption on the afternoon of 29 May sent an ash plume to a height of 1.2 km above the crater and deposited ash on the town of Severo-Kurilsk. Chikurachki remained at Concern Color Code Orange. The eruption that began at Chikurachki on 18 April continued during 23-28 May. Ash from an eruption began to fall on the Shelekhov settlement on 27 May at 1800. Ash plumes rose ~1 km above the volcano and drifted NE. Plumes were occasionally visible on satellite imagery. Chikurachki remained at Concern Color Code Orange. The eruption that began at Chikurachki on 18 April continued during 16-23 May. On 17 and 18 May ash-rich plumes were visible on satellite imagery drifting SW and NE, respectively. Chikurachki remained at Concern Color Code Orange. The eruption that began at Chikurachki on 18 April continued through 16 May. Satellite imagery showed several clouds, inferred to contain steam, gas, and ash. On 13 May ash deposits were seen on the volcano's ENE through SSE flanks, extending to the coast. Chikurachki remained at Concern Color Code Orange. The eruption that began at Chikurachki on 18 April continued through 9 May. On 1 May ash fell in the town of Severo-Kurilsk, ~60 km from the volcano. On 3 May weak fumarolic activity was seen, and on 5 May an ash-rich plume was observed extending to the NW. Chikurachki was at Concern Color Code Orange. Chikurachki began erupting on 18 April 2003 and the eruption was clearly continuing through 25 April. Associated ash plumes were over 100 km long. During this week, 30 April-6 May, the Tokyo VAAC issued ash advisories on Chikurachki plumes for aviators. Early in the week the critical visual and satellite observations remained ambiguous with respect to the presence of ash in the atmosphere. On 2 May (at 1934 UTC) U.S. Airforce meteorologists detected Chikurachki ash emissions at ~3 km altitude and moving ESE at ~50 km/hour. 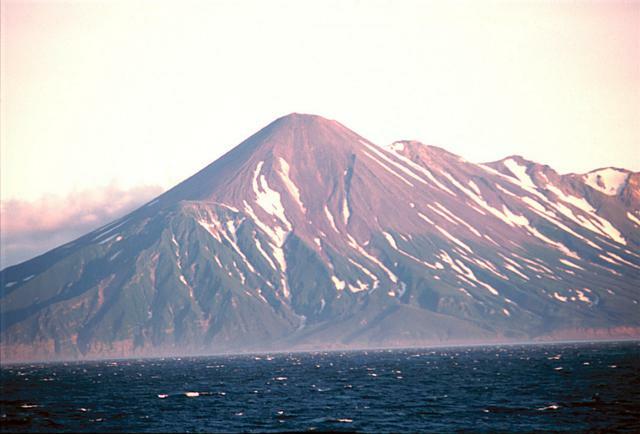 Chikurachki, a volcano located on Paramushir Island in the North Kuriles, began erupting on 18 April 2003. A KVERT update for 25 April stated that the eruption continued and satellite data confirmed that ash plumes had moved SE and occasionally E during 22-25 April. The plumes attained lengths over 100 km. On 22 April observers at Vasiliev Cape on Paramushir Island saw a white gas-steam plume rise 500 m above the volcano's crater. Chikurachki stratovolcano, located on Paramushir Island in the Northern Kuriles, began erupting on 18 April 2003. During the next few days observers described the ash falls and substantial plumes with estimated heights up to ~10 km altitude. Observers on Paramushir island saw ash explosions on 18 April; ash fell in Podgorny town and Cape Vasiliev. Satellite data for 18 April revealed that ash plumes moved towards the SSE and traveled a distance of more than 50 km. The Aviation Meteorological Center at Yelizovo airport reported that on 19 April ash plumes rose 2,000 m. Three distinct eruptive events were detected in satellite data on 19 April, in one case ash plumes extended over 50 km SE. The longest reported plume of the week occurred on 20 April; it reached over 250 km from the volcano towards the SE, later blowing E. Satellite analysts described a variety of plumes on 21 April: a narrow ash plume (visible ~130 km in length and trending SE), a comparatively wide ash plume (~ 25 km wide at a distance of ~50 km from the volcano), and some other ash plumes (over 50-70 km in length moving to the S). One reason why this eruption and its plumes are important is because they lie along a frequently traveled aviation route. Based on reports received from the town of Severo-Kurilsk, KVERT reported a continuation through 16 March of volcanism that began at Chikurachki on 25 January. On the 16th during 0700 to late evening ash fell in Podgorny settlement, ~20 km SE of the volcano. On a reconnaissance helicopter flight during 1100-1300, observers saw constant gas emissions and sustained ash explosions that rose 200 m above the volcano and extended more than 100 km SE. Reports from the town of Severo-Kurilsk revealed that renewed activity occurred at Chikurachki during 23-27 February. On 25, 26, and 27 February ash plumes occasionally rose above the crater and ash fell in the vicinity of Tukharka River. In addition, snow melted very quickly near the volcano. On  February an ash plume rose a short distance above the volcano and drifted to the NNE. During the report period several clouds were visible on AVHRR satellite imagery that may have been composed of gas and steam released from the volcano. According to reports KVERT received from the town of Severo-Kurilsk (~70 km NE of the volcano), volcanism that began at Chikurachki on 25 January had decreased by 20 February. Visual observations from a helicopter on 18 February revealed that a small new crater had formed in the SSE part of the volcano's summit crater. A gas-and-steam plume was visible rising 150 m above the crater and extending to the ESE. A stripe of fresh ash was visible on the volcano's E slope. No thermal anomaly or ash plume was visible on satellite imagery. KVERT reported that the possibility of ash explosions occurring remained. According to the Tokyo VAAC, possible eruptions on 21 February at 0325 and 24 February at 1232 may have produced ash clouds that rose to ~6 and 5.8 km, respectively. The volcanism that began at Chikurachki on 25 January continued through 8 February. On 7 February a hunter observed a persistent ash column reaching ~2.5 km a.s.l. The volcano is not visible from the closest town, Severo-Kurilsk, and there are no seismic stations on Paramushir Island. An eruption that began at Chikurachki on 25 January deposited ash in the town of Severo-Kurilsk between 1200 and 1500. On 2 February at 1200 an eruption was observed by a helicopter pilot. An ash column from the eruption rose 300 m above the crater and drifted more than 70 km SE. There are no seismic stations at the volcano, therefore, no Color Concern Code was assigned by KVERT. Crews of two fishing boats reported that a summit eruption began on 19 November at 1730. At 1807, a 1-km-high eruption column was observed, accompanied by strong electrical discharges. Geologists reported that during the day ash explosions fed a 3-km-high eruption column and a 20-m-thick lava flow, and three pyroclastic flows moved down the SE flank. Satellite images showed a plume extending roughly 350 km to the ENE at 2300. The next day, meteorologists at Cape Vasiliev (25 km SE of the volcano) reported loud rumbling and a large eruption plume. Geologists reported that the plume grew to ~500 km long and that two lava flows descended to 560 m altitude . . . . Five centimeters of ash accumulated 18 km from the vent and ash was also reported ~30 km away. Plumes were visible on images from Japan's GMS satellite: 120 km long on 20 November at 0431; 300 km at 1031 and 1631; 360 km at 2231; and 400 km on 21 November at 0300 (figure 1). Maximum altitude was ~10.5-11 km, based on a minimum cloud-top temperature of -51°C. Airplane pilots reported ash between 9.5 and 11 km altitude. This prompted the issuance of an official notice to aircraft (SIGMET) on 22 November at 0100, warning of ash within an irregular area bounded by 49°N, 154°E; 48°N, 179°E; 51°N, 178°W; 54°N, 165°E; and 53°N, 153°E. On 23 November, a 5-km-high gas-ash cloud was observed by geologists. Satellite images next showed activity on 24 November at 0300, but plume emission was less vigorous. After 1800, plume activity appeared to have ended. Satellite images on 26 and 30 November revealed possible small plumes that might have indicated continuing ash eruptions. Geologists reported that after 1 December lava production and explosions stopped. Preliminary ejecta volume estimates were ~0.1 km3. Figure 1. Chikurachki's eruption clouds from infrared images of Japan's GMS satellite, 20 November 1986. Courtesy of Yosihiro Sawada. Information Contacts: B. Ivanov, G. Bogoyavlenskaya, and A. Khrenov, IV; M. Matson, W. Gould, and S. Kusselson, NOAA/NESDIS; G. Steinberg, Yuzhno-Sakhalinsk; Y. Sawada, JMA; Sovietskaya Rossiya newspaper, Moscow; AP. Data from the TOMS instrument on the Nimbus-7 polar orbiting satellite showed that the November eruption produced substantial quantities of SO2. On 20 November at 1111, the zone of highest SO2 concentration extended ~400 km to the ENE (figure 2), the same direction but roughly twice the length of the plume evident on a GMS infrared image around the same time. Maximum SO2 concentrations reached at least 150 millitmosphere-cm, 300 km from the volcano. Meteorologists 25 km from the summit reported a large eruption plume that day. Geologists reported that lava production and explosions ended after 1 December. The next day at 1121, TOMS data showed no areas of enhanced SO2 in the immediate vicinity of the volcano, but remnants of the cloud several hundred kilometers to the SW and NE included SO2 concentrations of at least 20 milliatmosphere-cm (figure 2). Figure 2. Preliminary SO2 data from the Nimbus-7 TOMS on 20 November 1986 at 1111 (top) and 2 December 1986 at 1121 (bottom). On 20 November the average column density is in units of 15 milliatmosphere-cm (150 ppm-m): 0 = <15; 1 = 15-29; 2 = 30-44, etc. On 2 December the average column density is in units of 5 milliatmosphere-cm; 0 = <4; 1 = 5-9; 2 = 10-14, etc. Courtesy of Arlin Krueger. Information Contacts: A. Krueger, GSFC. The 19 November ash and lava eruption was preceded by increased fumarolic activity seen during overflights on 12 and 14 November. Intense vapor and gas emission occurred from much of the upper volcano, obscuring the crater. Pyroclastic flows on the upper slopes were covered with snow but those near the foot of the volcano were snow-free. No explosions were noted. Poor weather conditions prevented summit observations during a 22 August overflight . . . by a team from the SVE. A fumarolic area at the foot of the SE slope, near the pass between Tatarinov volcano and Chikurachki, was covered with yellow sulfur deposits. The last report of volcanism at Chikurachki on Paramushir Island in the northern Kuriles (figure 3) was made by crews on fishing boats near the volcano on 19 November 1986; activity consisted of lava flows, ash clouds, and pyroclastic flows (SEAN 11:11, 11:12, and 12:01). Chikurachki is not seismically monitored, and therefore the Kamchatka Volcanic Eruptions Response Team (KVERT) does not use a Color Concern Code to label the level of activity. The volcano is not visible from the closest town from which KVERT receives ashfall reports from, Severo-Kurilsk (~55 km NE of the volcano). Information about volcanism comes from crews on vessels and pilots passing Paramushir Island. Figure 3. Map of Paramushir Island showing Chikurachki volcano on the SW part of the island, Fuss Peak volcano forming a peninsula to the SW, Ebeko volcano at the N end of the island, and the town of Severo-Kurilsk on the NE side of the island. This map is a segment from the Tactical Pilotage Chart E-10C of the NOAA Sectional Aeronautical Chart Series. Compiled in October 1984 by the Defense Mapping Agency Aerospace Center. Courtesy of NOAA. An eruption began at Chikurachki on 25 January. The start time of the eruption is not known, but between 1200 and 1500 ash fell to the NE in Severo-Kurilsk. The ash mixed with snow and formed a layer ~1.5 mm thick; the thickness of the ash alone was probably ~10-30% less. On 2 February an eruption was seen by a helicopter pilot. At 1200 that day an ash column rose 300 m above the volcano's crater and drifted more than 70 km to the SE. The next report of volcanism at Chikurachki was made by a hunter on 7 February. He heard thunder and saw a persistent ash column rising to ~2.5 km altitude. The upper portion of the ash cloud was obscured by low cloud cover, so the ash cloud's exact height and direction of movement were not known. Reports of activity at Chikurachki also prompted news reports stating that Ebeko, ~60 km NE of Chikurachki, was erupting (figure 3). The reports were found to be false; Chikurachki was the only volcano on Paramushir Island to be active in January. According to reports from Severo-Kurilsk, by mid-February volcanism at Chikurachki had decreased. Visual observations from a helicopter on 18 February revealed that a small new crater had formed on the SSE part of the volcano's summit crater. In addition, a gas-and-steam plume rose 150 m above the crater and extended to the ESE. A stripe of fresh ash was seen on the volcano's E slope. A satellite image, taken on 18 February at 1649, provided a relatively clear view of Chikurachki; no thermal anomaly or volcanic plume was visible. Although the level of volcanic activity decreased, KVERT stated that ash explosions could still occur. According to the Tokyo VAAC, possible eruptions on 21 February at 0325 and 24 February at 1232 may have produced ash clouds that rose to ~6 and 5.8 km, respectively. Information Contacts: Olga Chubarova, Kamchatka Volcanic Eruptions Response Team (KVERT); Thomas P. Miller, Alaska Volcano Observatory (AVO), 4200 University Drive, Anchorage, AK 99508, USA (URL: http://www.avo.alaska.edu/); Tokyo Volcanic Ash Advisory Center, Tokyo, Japan (URL: http://ds.data.jma.go.jp/svd/vaac/data/); National Oceanic and Air Administration (NOAA), 14th Street & Constitution Avenue, NW, Room 6013, Washington, DC 20230 (URL: http://www.noaa.gov). Eruptive activity at Chikurachki began on 25 January 2002. Ash plumes were observed, and a small new crater formed on the SSE part of the summit crater. By mid-February, volcanism decreased, but the Kamchatkan Eruptions Response Team (KVERT) stated that ash explosions could still occur (BGVN 27:01). During 23-27 February, reports from the town of Severo-Kurilsk revealed renewed activity. On 25, 26, and 27 February ash plumes occasionally rose above the crater and ash fell in the vicinity of Tukharka River. In addition, snow melted very quickly near the volcano. On 8 February an ash plume rose a short distance and drifted NNE. Several clouds were visible on AVHRR satellite imagery that may have been composed of gas and steam from the volcano. KVERT reported a continuation of eruptive activity through at least 16 March. On that day, beginning at 0700 and lasting until late evening, ash fell in Podgorny settlement, ~20 km SE of the volcano. On a reconnaissance helicopter flight during 1100-1300, observers saw constant gas emissions and sustained ash explosions that rose 200 m above the volcano and extended more than 100 km SE. A new eruption that began at Chikurachki on 18 April 2003 was reported by the Kamchatka Volcanic Eruptions Response Team (KVERT) and the Alaska Volcano Observatory (AVO). The most recent previous eruption occurred in early 2002 (BGVN 27:01 and 27:04). Ash explosions were seen by observers on Paramushir Island, and at 1500 and 2000 ashfall was observed in Podgorny town and Cape Vasiliev. The Aviation Meteorological Center at Yelizovo Airport reported that on 19 April ash plumes rose 2,000 m above the crater. According to satellite data from the USA, distinct volcanic events were detected at approximately 2300 on 19 April, 0200 on 20 April, and 0430 on 20 April (1200, 1500, and 1730 UTC, 19 April), with the ash moving towards the SE. Interpretation of satellite imagery revealed plumes extending more than 50 km SE and SSE during 18-19 April, with the longest reaching more than 250 km at 1501 on the 19th. Visual data from Vasiliev Cape and Paramushir Island on 22 April showed a white gas-and-steam plume that rose 500 m above the crater. According to satellite data from the USA and Russia, ash plumes less than 100 km long were moving SE and E during 22-25 April. Longer plumes on 25 April were directed NNE. Observers from Vasiliev Cape noted a white plume rising ~500 m above the crater on 27 April. On 28 April residents in Severo-Kurilsk observed a very fine layer of gray ash (less than 1 mm thick) near the city, 3 km S of the volcano. The longest plume seen in satellite imagery during April was more then 300 km long when observed at 2028 on 29 April. Information Contacts: Olga Girina, Kamchatka Volcanic Eruptions Response Team (KVERT), Institute of Volcanic Geology and Geochemistry (IVGG), Piip Ave. 9, Petropavlovsk-Kamchatsky, 683006, Russia; Alaska Volcano Observatory (AVO), a cooperative program of a) U.S. Geological Survey, 4200 University Drive, Anchorage, AK 99508-4667, USA (URL: http://www.avo.alaska.edu/), b) Geophysical Institute, University of Alaska, PO Box 757320, Fairbanks, AK 99775-7320, USA, and c) Alaska Division of Geological & Geophysical Surveys, 794 University Ave., Suite 200, Fairbanks, AK 99709, USA. The eruption that began on 18 April 2003 (BGVN 28:04) continued throughout May and into early June. According to observers, ash fell on the town of Severo-Kurilsk (~60 km from the volcano) on 1 May. Observers from Vasiliev Cape noted weak fumarolic activity on 3 May and satellite data from the USA and Russia that day revealed a gas-and-steam plume more than 150 km long and moving towards the ESE and S. Satellite data continued to show gas-and-steam plumes, possibly containing ash, throughout the remainder of May (table 1). Satellite imaging was obscured by clouds on other days. On 13 May, ash deposits were reported on the ENE and SSE flanks of the volcano and near the summit. At 1800 on 15 May, observers on Paramushir Island reported a strong ashfall at Podgorny settlement. Table 1. Satellite data reports of gas-and-steam and ash plumes emanating from Chikurachki, May 2003. Courtesy of KVERT. During the period 1930 to 2310 on 27 May, Leonid Kotenko on Paramushir Island reported that ash explosions attaining heights of 500 m above the crater were observed from Shelekhov Bay. The ash plume at 0900 on 28 May (2200 UTC, 27 May), rose 4,000 m above the crater. On 29 May an ash plume rose ~1,200 m above the crater and ash fell on the town of Severo-Kurilsk. Additional information about the 2002 eruption. Previous KVERT reports indicated that the eruption that began on 25 January 2002 had continued through 16 March (BGVN 27:04), but no further reports were made about that activity. However, later information was received that showed the eruption continuing through at least 22 April. According to satellite data from AVO for 18 March, two consecutive GMS infrared images (1732 and 1832 UTC) showed a narrow, ~150-km-long cloud, which extended SE from Paramushir Island. There was no indication of ash based on the split-window technique. On the afternoon of 20 March, a gas-and-steam plume with some ash extended 200 km SE. Paramushir Island was obscured by clouds during the next 2 weeks. On 6 May L. Kotenko (A KVERT contact on the island) reported that hunters had observed fresh ash deposits on the SW flank on 22 April and that ashfall was also noted in Severo-Kurilsk. Information Contacts: Olga Girina, Kamchatka Volcanic Eruptions Response Team (KVERT), a cooperative program of the Institute of Volcanic Geology and Geochemistry, Far East Division, Russian Academy of Sciences, Piip Ave. 9, Petropavlovsk-Kamchatsky, 683006, Russia, the Kamchatka Experimental and Methodical Seismological Department (KEMSD), GS RAS (Russia), and the Alaska Volcano Observatory (USA); Alaska Volcano Observatory (AVO), a cooperative program of a) U.S. Geological Survey, 4200 University Drive, Anchorage, AK 99508-4667, USA (URL: http://www.avo.alaska.edu/), b) Geophysical Institute, University of Alaska, PO Box 757320, Fairbanks, AK 99775-7320, USA, and c) Alaska Division of Geological and Geophysical Surveys, 794 University Ave., Suite 200, Fairbanks, AK 99709, USA. The eruption of the Chikurachki volcano that began on 18 April 2003 continued into mid-July. Ash explosions, possibly up to 4 km above the crater, diminished, and by 3 July only rose up to 2 km above the crater. The volcano is remote, being ~60 km from Severo-Kurilsk on Paramushir Island. It also lacks seismic instruments, and the Kamchatka Volcanic Eruptions Response Team (KVERT) receives only occasional reports from Severo-Kurilsk. According to a report from Leonid Kotenko of Severo-Kurilsk, ash explosions up to 500 m above the crater were observed from Shelekhov bay during 1930-2310 on 27 May. Ash plumes extended 70-80 km to the NE. At 0900 on 28 May, an ash plume rose 4 km above the crater and extended over 100 km to the NE. From 1030 on the same day, the plume heights decreased to 500 m above the crater. On 29 May, low-level ash plumes extended 15-20 km to the NE. In the afternoon of 29 May, an ash plume rose ~1.2 km above the crater, extended over Severo-Kurilsk, and ash fell on the town. Explosions occurred continually. MODIS (moderate resolution imaging spectroradiometer) Terra and Aqua Goddard images from 1105 and 1235 on 30 May, depicted a faint, small ash cloud trending to the E. Clouds obscured the volcano on the other days in later May. Kotenko reported on 6 June that the eruption continued. On 8 June, an ash plume extended 25-30 km to the SSE. On 9-10 June, the plume did not rise more than 500 m above the volcano and extended SSE. Ash fell on the Podgorny settlement, located at a distance of ~20 km SSE of the volcano. The observers from Shelekhov bay had noted more strong explosions during the night than in the day-time. In the AVHRR (advanced very-high resolution radiometer) image at 1308 on 6 June, a narrow weak ash plume was observed extending to the SE for about 100 km from the volcano. In MODIS Goddard Terra images at 1100 on 8 June and at 1145 on 9 June, a narrow plume was seen extending to the SE for ~100 km. In the AVHRR image at 1245 on 9 June, this plume was also seen, but no ash was detected. Clouds obscured the volcano on the other days. According to observers from Shelekhov settlement, on 15-16 June an ash plume was observed constantly at the volcano summit. The plume did not rise upwards, but was bent down the flanks of the volcano by a strong wind. On 17 June, observers saw a short gas-steam plume bent by a gale-force wind. On 18 June, Kotenko reported that the eruption continued. On other days, clouds obscured the volcano and prevented observation. According to the last report from Severo-Kurilsk, on 17-25 June, when the weather was good, fishermen from Shelekhovo bay observed only gas-steam activity from the volcano. By 3 July, KVERT reported that the eruption of Chikurachki had possibly finished. According to satellite data from the USA and Russia, no activity of the volcano was noted from 25 June through 11 July. Chikurachki last erupted during April to June 2003 (BGVN 28:07) and subsequently was apparently dormant for nearly two years. On 1 March 2005, observers in Severo-Kurilsk (~ 70 km NE of Chikurachki) saw a gas-and-steam plume rise ~ 400 m above the volcano. On 12 March 2005, MODIS satellite imagery showed an ash plume extending NNW from the volcano and led KVERT to raise the concern color code from Green to Yellow. On 23 March, satellite imagery showed a weak ash plume extending ~ 70 km E. The height of the plume was unknown, and on 25 March the hazard status was raised again from Yellow to Orange. Chikurachki is not monitored with seismic instruments but KVERT has access to satellite data and occasional visual observations of the volcano. Ash from Chikurachki fell on the southern part of Paramushir Island on 29 March. Ash deposits were visible on satellite imagery on 25 and 29 March; on the 29th they extended 19 km SE. Chikurachki remained at concern color code Orange. During April 2005, weak fumarolic activity occurred at Chikurachki. Ash deposits covered the WNW slope of the volcano. On 7 April, an ash-and-gas plume rose to ~ 500 m above Chikurachki's crater and extended ~ 10 km S. The concern color code remained Orange through 15 April 2005 and was reduced to Yellow when satellite imagery during the week of 20-26 April did not show any thermal anomalies or ash plumes. Since that time there has been no further indication of activity. In 2005 Gurenkoa and others published a study of glass inclusions and groundmass glasses from Chikurachki explosions in an effort to better understand the relatively rare, highly explosive eruptions of basaltic composition. Such eruptions may be important in terms of atmospheric impact because of the generally much higher solubilities of S in basaltic melts compared with silicic melts. Concentrations of H2O, major, trace and volatile (S, Cl) elements by EPMA and SIMS from glass inclusions and groundmass glasses of the 1986, 1853, and prehistoric explosive eruptions of basaltic magmas were studied. Several ash plumes, weak fumarolic activity, and ashfall occurred during March and April 2005 (BGVN 31:03). No further activity was reported until 4 March 2007, when weak ash explosions from Chikurachki were reported by residents of Podgorny, about 20 km ESE on Paramushir Island (figure 4). Chikurachki is not monitored with seismic instruments, so the Kamchatkan Volcanic Eruption Response Team (KVERT) relies on satellite data and occasional visual observations. Figure 4. Map of the northern Kurile Islands and southern portion of Kamchatka Peninsula. From National Oceanic and Atmospheric Administration Tactical Pilotage Chart ONC-E10C, as provided by McGimsey and others (2005). On 5 March 2007, observers reported that a continuous ash column reached an altitude of 3.4 km. Ash plumes were also observed by satellite imagery during 11-12 March, 4-5 April, 9 April, 14-16 April, and 18 April. On 4 April, ashfall was noted at Severo-Kurilsk, 62 km NE. Hunters near the volcano observed bursts of volcanic bombs on 15 April. Satellite data analysis provided by the Volcanic Emissions Group at the University of Maryland Baltimore County revealed a sulfur dioxide cloud on 16 March 2007 extending 580 km NW at an unknown altitude. According to KVERT, no eruptive activity has been noted since about 20 April. The concern color code was reduced from Orange to Yellow during the week of 20 April, and then to Green (lowest risk) during the week of 11 May. Reference. McGimsey, R.G., Neal, C., and Girina, O., 2005, 2003 volcanic activity in Alaska and Kamchatka summary of events and response of the Alaska Volcano Observatory: U.S. Geological Survey report 2005-1310, http://pubs.usgs.gov/of/2005/1310. Information Contacts: Olga Girina, Kamchatka Volcanic Eruptions Response Team (KVERT), a cooperative program of the Institute of Volcanic Geology and Geochemistry, Far East Division, Russian Academy of Sciences, Piip Ave. 9, Petropavlovsk-Kamchatsky, 683006, Russia; Alaska Volcano Observatory (AVO), a cooperative program of the U.S. Geological Survey, 4200 University Drive, Anchorage, AK 99508-4667, USA (URL: http://www.avo.alaska.edu/); Tokyo Volcanic Ash Advisory Center, Tokyo, Japan (URL: http://ds.data.jma.go.jp/svd/vaac/data/); Volcanic Emissions Group, based in the Joint Center for Earth Systems Technology at the University of Maryland Baltimore County and NASA Goddard Space Flight Center, 1000 Hilltop Circle, Baltimore, MD 21250, USA (URL: https://so2.gsfc.nasa.gov/). Olga Girina of the Kamchatka Volcanic Eruptions Response Team (KVERT) reported no eruptive activity at Chikurachki volcano [activity that began 4 March 2007 (BGVN 32:05)] after about 18 April 2007. The following report was based primarily on information found on the KVERT website. Chikurachki is not monitored with seismic instruments, but KVERT has satellite monitoring and receives occasional reports of visual observations (figure 5). Figure 5. Ash plume extending to the ESE from Chikurachki on 8 September 2007. Photo by L. Kotenko, supported by JSPS (Japan Society for the Promotion of Science); courtesy of KVERT Current Activity of Chikurachki website. According to observations, no eruptive activity was noted on 12 and 14 August. However, visual information from Podgorny (20 km SSE) indicated that an eruption began on 18 August 2007 at 2200 UTC. Ashfall was noted in Podgorny at that time and on 19-20 August, and satellite data showed an ash plume extending about 120 km SE (figure 6). An ash plume extending about 100 km SE at an altitude of 5 km was observed by pilots on 20 August 20 at 0140 UTC. An ash plume extending about 160 km to the NNE at an altitude of 3 km and ashfall on Alaid volcano were noted by volcanologists on 21 August. Table 2 lists observations, when available, of the ash plume during this eruption. Figure 6. Plume from Chikurachki taken 19 August 2007 by the Moderate Resolution Imaging Spectroradiometer (MODIS) flying on NASA's Aqua satellite. Besides Chikurachki, whose plume blows SE over the ocean, the image captures the summits of neighboring volcanos Atlasova Island and Fuss Peak above the cloud cover. Courtesy of NASA Earth Observatory. Table 2. Ash plume observations for the eruption of Chikurachki beginning 18 August 2007. Clouds obscured the volcano on most days not noted. Courtesy of KVERT. The eruption continued through at least 25 October 2007, and perhaps through 8 November. Clouds obscured the volcano on many days, making estimates of the continuity of this eruption and its ending date difficult. KVERT has reported no later plumes observed over Chikurachki to mid-April 2008. No thermal anomalies were measured by the MODIS satellites during 2007 or 2008 to 20 April. Information Contacts: Olga Girina, Kamchatka Volcanic Eruptions Response Team (KVERT), a cooperative program of the Institute of Volcanic Geology and Geochemistry, Far East Division, Russian Academy of Sciences, Piip Ave. 9, Petropavlovsk-Kamchatsky, 683006, Russia, the Kamchatka Experimental and Methodical Seismological Department (KEMSD), GS RAS (Russia), and the Alaska Volcano Observatory (USA) (URL: http://www.kscnet.ru/ivs/kvert/updates.shtml); Alaska Volcano Observatory (AVO), a cooperative program of the U.S. Geological Survey, 4200 University Drive, Anchorage, AK 99508-4667, USA (URL: http://www.avo.alaska.edu/), the Geophysical Institute, University of Alaska, PO Box 757320, Fairbanks, AK 99775-7320, USA, and the Alaska Division of Geological and Geophysical Surveys, 794 University Ave., Suite 200, Fairbanks, AK 99709, USA; NASA Earth Observatory Natural Hazards (URL: http://earthobservatory.nasa.gov/NaturalHazards/); KVERT Current Activity of Chikurachki (URL: http://www.kscnet.ru/ivs/kvert/current/chkr/). The previous eruption at Chikurachki (figure 7) began in March 2007 (BGVN 32:05) and ended in November 2007 (BGVN 33:03). According to the Tokyo VAAC, based on observations of satellite imagery, eruptive activity resumed on 29 July 2008. KVERT reported that an ash plume rose to an altitude of 6.1 km and drifted more than 30 km WSW; during 30-31 July ash plumes drifted S.
Figure 7. Digital model of the relief of Chikurachki created from a LANDSAT 7 (satellite) image. View is toward the SW. Created by D.V. Melnikov. Seismicity was imperfectly known because Chikurachki is not monitored with a dedicated seismometer. One telemetered seismic station resides on Alaid volcano, 58 km NNW (figure 8). Figure 8. Map showing seismic stations in Kuril islands used to monitor Chikurachki. The terms Severo and Yuzhno mean "North" and "South." respectively. Compiled from multiple sources by Bulletin editors. Eruptive activity continued during 1-8 August (figure 9); ash plumes drifted more than 60 km SE, W, and N. During 1-3 August the plume rose to an altitude of 2.7 km. There were no confirmed ash eruptions after 8 August. Figure 9. Explosive eruption of Chikurachki showing an ash plume extending SE on 2 August 2008. Photo by A. Gruzevich (Russian Federal Research Institute of Fisheries and Oceanography). Information Contacts: Kamchatka Volcanic Eruptions Response Team (KVERT), Institute of Volcanology and Seismology (IVS), Far East Division, Russian Academy of Sciences, Piip Ave. 9, Petropavlovsk-Kamchatsky, 683006, Russia (URL: http://www.kscnet.ru/ivs/); Dmitriy Melnikov, KVERT, Russia; Tokyo Volcanic Ash Advisory Center (VAAC), Tokyo, Japan (URL: https://ds.data.jma.go.jp/svd/vaac/data/); Anatoliy Gruzevich, Russian Federal Research Institute of Fisheries and Oceanography (VNIRO),Federal State Unirtary Enterprise, 17, V. Krasnoselskaya Str., Moscow, 107140, Russia (URL: http://www.vniro.ru/en/). An explosive episode at Chikurachki occurred during 15-18 February 2015, the first eruption since the 29 July-8 August 2008 event (BGVN 33:08). This report discusses this short-term episode and another possible one in April 2015. The Kamchatka Volcanic Eruptions Response Team (KVERT) does not monitor the volcano with seismic instruments, but uses satellite monitoring and receives occasional visual observations. All dates and times are UTC (local time + 12 hours). According to KVERT, the Tokyo Volcanic Ash Advisory Center (VAAC) stated that an explosion at Chikurachki began at 2200 UTC on 15 February 2015 and continued through 18 February (figure 10). The Tokyo VAAC reported that, on 16 February, ash plumes rose to an altitude of 7-7.5 km and eventually drifted up to 230 km W and SW; KVERT also reported a component that drifted E and a thermal anomaly. The Aviation Color Code was raised to Orange on 15 February. Figure 10. Landsat satellite image of Chikurachki acquired on 17 February 2015. The Operational Land Imager (OLI) on Landsat 8 captured a natural-color view of the explosion. Courtesy of NASA Earth Observatory, using Landsat data from the U.S. Geological Survey. On 18 February, KVERT noted that satellite images showed an ash plume at an altitude of 3.5 km drifting about 280 km E and SE. Satellite images showed no activity on 19 February or immediately thereafter. The Aviation Color Code was lowered to Yellow on 21 February and to Green on 26 February. An observer from Severo-Kurilsk (60 km NW, Paramushir Island) reported that on 18 April 2015 a gas-and-steam plume from Chikurachki contained a small amount of ash, so the Aviation Color Code was raised to Yellow. However, later analysis of satellite images did not indicate either a thermal anomaly or ash plumes that day. The Aviation Color Code was therefore lowered back to Green on 23 April. Information Contacts: Kamchatka Volcanic Eruptions Response Team (KVERT), Far East Division, Russian Academy of Sciences, 9 Piip Blvd., Petropavlovsk-Kamchatsky, 683006, Russia (URL: http://www.kscnet.ru/ivs/); Tokyo Volcanic Ash Advisory Center (VAAC), Tokyo, Japan (URL: http://ds.data.jma.go.jp/svd/vaac/data/); NASA Earth Observatory, EOS Project Science Office, NASA Goddard Space Flight Center, Goddard, Maryland, USA (URL: http://earthobservatory.nasa.gov/). 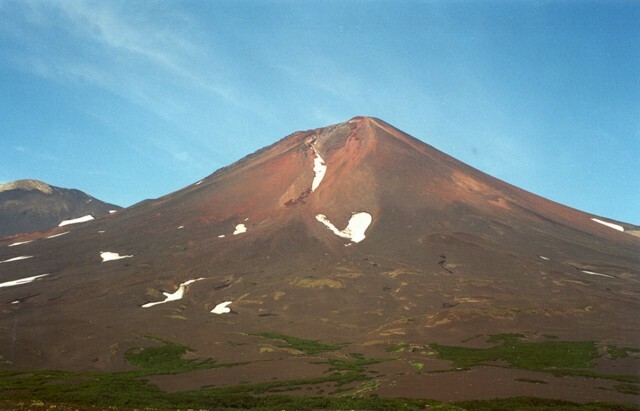 Chikurachki, the highest volcano on Paramushir Island in the northern Kuriles, is actually a relatively small cone constructed on a high Pleistocene volcanic edifice. Oxidized basaltic-to-andesitic scoria deposits covering the upper part of the young cone give it a distinctive red color. Frequent basaltic plinian eruptions have occurred during the Holocene. Lava flows from 1781-m-high Chikurachki reached the sea and form capes on the NW coast; several young lava flows also emerge from beneath the scoria blanket on the eastern flank. The Tatarinov group of six volcanic centers is located immediately to the south of Chikurachki, and the Lomonosov cinder cone group, the source of an early Holocene lava flow that reached the saddle between it and Fuss Peak to the west, lies at the southern end of the N-S-trending Chikurachki-Tatarinov complex. In contrast to the frequently active Chikurachki, the Tatarinov volcanoes are extensively modified by erosion and have a more complex structure. Tephrochronology gives evidence of only one eruption in historical time from Tatarinov, although its southern cone contains a sulfur-encrusted crater with fumaroles that were active along the margin of a crater lake until 1959. Gurenko A A, Belousov A B, Trumbull R B, Sobolev A V, 2005. Explosive basaltic volcanism of the Chikurachki volcano (Kurile arc, Russia): insights on pre-eruptive magmatic conditions and volatile budget revealed from phenocryst-hosted melt inclusions and groundmass glasses. J. Volcanol. Geotherm. Res., 147: 203-232. Ovsyannikov A A, Muraviev Y D, 1992. The 1986 eruption of Chikurachki volcano. Volc Seism, 1992(5-6): 3-20 (English tranlation 1993, 14: 493-514). There is no Deformation History data available for Chikurachki. There is data available for 7 emission periods. Expand each entry for additional details. The tephra deposits in the foreground at the eastern base of Chikurachki volcano were deposited during a major explosive eruption of in 1986. An explosive eruption began on November 18 and reached its peak on November 20-21 when maximum cloud heights of 10.5-11 km were reported. Pyroclastic flows traveled down the ESE flank. On November 22 lava flow emission began, producing flows that were active until December 7 and descended to 560 m elevation on the SE flank. Photo by Alexander Belousov, 2000 (Institute of Volcanology, Kliuchi). Chikurachki, the highest volcano on Paramushir Island, is a relatively small cone constructed on a high Pleistocene volcano. The eastern side of the volcano is seen here with brightly colored oxidized scoria covering the upper part of the cone, giving it a distinctive red color. 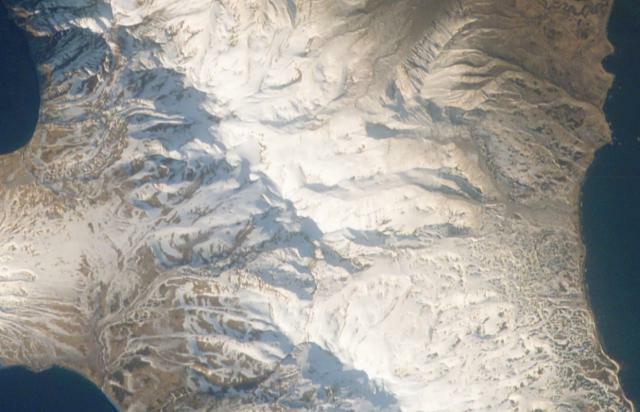 The peak at the left is part of the Tatarinov group of six volcanic centers, located immediately south of Chikurachki. The Tatarinov volcanoes are extensively modified by erosion, and all but one of the historical eruptions of the Chikurachki-Tatarinov complex have occured from Chikurachki. The NW slopes of Chikurachki, the highest volcano on Paramushir Island, rise above the Sea of Okhotsk. Oxidized scoria covering the upper part of the cone give it a distinctive red color. The Tatarinov group of six volcanic centers is located immediately to the south of Chikurachki, forming the ridge on the right horizon. In contrast to the frequently active Chikurachki, the Tatarinov volcanoes are extensively modified by erosion and have a more complex structure. The chain of volcanoes descending diagonally across the image at the upper left (north) in this Space Shuttle image is the Lomonosov volcano group. It lies east of Fuss volcano, whose flanks appear on the broad peninsula at the lower left. 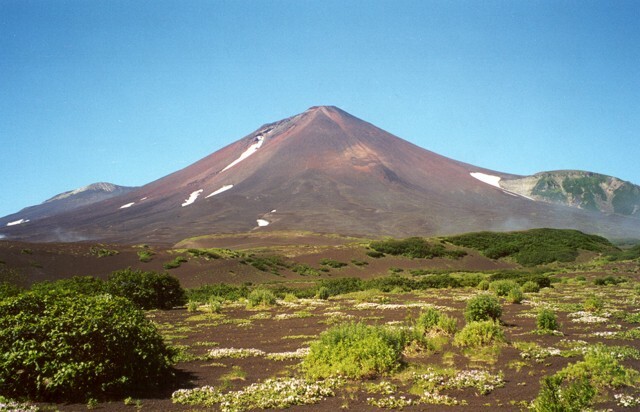 The Lomonosov group consists of four cinder cones and a lava dome of Holocene age that were constructed along a N-S line. A lava flow with prominent levees can be seen descending to the left from Lomonosov proper, a lava dome near the southern end of the volcano group. NASA Space Shuttle image ISS004-E-611694, 2002 (http://eol.jsc.nasa.gov/). An ash-rich plume extends across the length of Paramushir Island in the northern Kuriles on April 26, 2003 in this NASA Space Shuttle image (with north to the left). An explosive eruption of Chikurachki began on April 18, producing ash plumes up to about 2 km above the crater. On May 1ash fell on the town of Severo-Kurilsk (~60 km from the volcano), and intermittent activity continued until early July. Alaid volcano is at the far left. NASA Space Shuttle image ISS006-E-52695, 2003 (http://eol.jsc.nasa.gov/). There are no samples for Chikurachki in the Smithsonian's NMNH Department of Mineral Sciences Rock and Ore collection. Large Eruptions of Chikurachki Information about large Quaternary eruptions (VEI >= 4) is cataloged in the Large Magnitude Explosive Volcanic Eruptions (LaMEVE) database of the Volcano Global Risk Identification and Analysis Project (VOGRIPA).